When NetGalley first launched, one of the very first books we had on the site was Last Night in Montreal by Emily St. John Mandel. 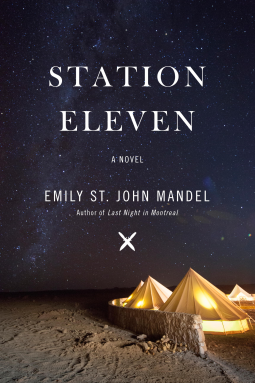 Today both NetGalley’s and St. John Mandel’s profiles have grown tremendously, but reviewing Station Eleven still feels a bit like coming home. In the last three books I’ve read, the world as we know it has ended: a disquieting trend that has me catching my kids for an extra kiss, just in case. I started with California, the Colbert-fueled sensation by Edan Lepucki, and moved to The Book of Strange New Things by Michael Faber, featured in the latest edition of the Buzz Book project we promote in partnership with Publishers Lunch. Of the three, Station Eleven is preferred. (Though a quick note on The Book of Strange New Things, which has not garnered nearly the same media attention: the central character, a priest with a checkered history of alcohol and drug abuse, addresses questions of faith so beautifully and simply, it’s worth a read. The missives between the priest, who is serving as a missionary on a new planet, and his wife, who remains on Earth as the world deteriorates, strike a perfect balance of the mundane and profound in a way that all couples can relate. It’s a book to give to a friend who likes to ponder, can appreciate clever and sophisticated writing and themes, but has a good sense of fun, too. There is a current of understated humor running throughout. But back to Station Eleven, where the motto of the book’s traveling symphony is cheekily taken from Star Trek: Because survival is insufficient. The book is a swan song for all that is lost in the world, big and small, and the author captures that sentiment in a way that had me looking around for days at all the “taken for granted miracles that had persisted all around them.” The characters in the book are connected cleverly throughout the book—-a paperweight passes from friend to ex-wife to mistress; a dog’s name persists from pre-apocalypse to Year 15 of a new world; and more. The book cleverly see-saws between the character’s connections at the end of the current world, and their roles and histories twenty years hence. Most of all (and missing from the other two books) Station Eleven is hopeful. In the most bitter of environments, Shakespeare persists, costumes are meaningful, and objects continue to have sentimental meaning. It’s that element that had us select this book at our UK Book of the Month (check out the UK cover here) and why it’s sure to top many lists over the coming months.